Alona Beach is a tropical paradise located on Panglao Island. It is currently Bohol’s top beach destination for the sake of its white sand beach, blue waters and world class diving. It attracts an enormous amount of travelers each year as it’s full of restaurants and diving centers. Once you come here, you will be surrounded with palm trees that veer towards the crystal clear waters (check out our Alona Beach gallery to see that). There are rocky cliffs on both ends of the beach, and some excellent snorkeling or diving within swimming distance from the beach. And while there are so many things to do in Bohol, hanging out at Alona Beach is definitely a highlight. Let me start from saying that we didn’t book our accommodation in advance. Once the bus stopped at the beach area, we were off to look for a room. We asked many locals and visited more than 10 different hostels and bungalows. The prices we were quoted varied from PHP3.000 ($67) to PHP1.300 ($29). That was definitely way too much for us. We waited til it got really dark and then had another go. Successfully, we found a room for two for PHP700 ($16) so we paid $8 each. Our advice: Look for a room around the beach after 9 pm. When it gets dark, the area get empty. The prices go down and you don’t need to haggle much to get something cheap. We could do some laundry outside (see in the picture). No light in the bathroom (we used the torch). If you are missing grilled food, Alona is the place! The whole area is surrounded by Filipino and Western restaurants where all kinds of food is served – from pancakes and peanut butter toast for breakfast to grilled fish/snails/crabs for dinner. Any food you could possibly think of is served here. Surprisingly, there were not many fresh fruits at the beach. There were a few stands where you could get a smoothie or fruit juice from, but fruits were not sold separately. You have to walk to the other side of the road in search of fruit stores. We often headed to a local store located just on the other side of the road to grab some breakfast rolls, dried fruits and milk. That never cost us more than PHP120 ($2.70). The other day we went to a small restaurant to have a proper Western breakfast which consisted of two fried eggs, 2 pieces of bread, two slices of tomato and cucumber and a mug of coffee. That cost us PHP120 ($2.70) for two, but trust me we were hungry shortly after the meal. If you rent a scooter, you can easily travel around and search for cheap Filipino food. We’ve heard you can get a plate of chicken, noodles and veggies for PHP80 ($1.79) which is nearly nothing for the quality and quantity of food you get. Renting a scooter costs around PHP500 ($11) a day, but it is totally worth it if you decide to see the marvelous Chocolate Hills. Otherwise, it’s a waste of money. You can walk everywhere or take a local bus. The ticket costs PHP25 ($0.56). When in Alona, we mixed Western food with some local food. The reason being, we didn’t always enjoy the street food (read more in I would rather go hungry than eat Filipino food again post). One night we went to Alberto’s pizza and ordered a huge pepperoni pizza with a tonne of cheese. That cost us PHP130 ($2.91) plus coke PHP15 ($0.34). That gives us a total spending of $1.70 a person for dinner. Alberto’s pizza was fresh and delicious. The staff were amazing and we enjoyed our dinner a lot. Therefore, we would like to recommend this place to anyone who’s in Alona and craves some pizza. The other night we went to a local place where we tried some seafood for a lunch. A huge grilled fish served with veggies and a bowl of rice cost us PHP150 ($3.40). That is around $1.70 a person. On top of that we always bought some snacks (dried fruits, crisps, candies, cookies) which was no more than PHP160 ($3.60) for two, $1.80 a person. They are the most famous tourist attraction in Bohol. It’s an amazing group of mound-shaped hills that turn brown during the dry season, hence the “chocolate”. How can you get there on the cheap? Rent a scooter and share it with a travel buddy. That will cost you around $5-$6. Fish market is around a 10 minute walk from the ferry station. It’s definitely a good place to dine out on the cheap. You can not only have grilled seafood there, but also fresh fruits and veggies. The prices vary from $1-$3 per dish and the portions are massive, so you can share it with somebody. Forget about taxis, jeepneys and tricycles and travel by buses or walk. That can certainly save you a lot of money. A single bus ride is only $0.56! One of the most important things to remember when visiting Alona Beach is that the more people that travel with you, the cheaper it is to stay there. You can share the room, food and scooter fees with another person which will be not only cheaper but definitely more fun! 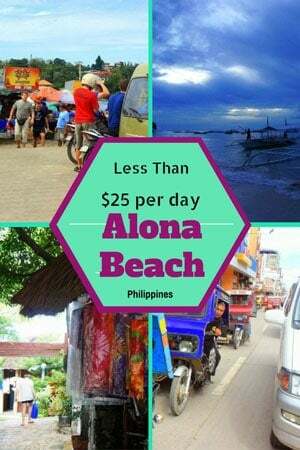 Have you been to Alona Beach? If so, do you have anything to add to the list? If not, would you like to go there? Currently living in Dumaguete. Been here about two years. Ready for a change. Alona has been recommended to me. I would welcome any comments on living in Alona. Thank u in Advane! I’m from Bohol and I love going to Alona. So awesome. We would love to get to Alona. Agness wrote a great article for us. Looks beautiful. Thanks. Agness wrote a great article for us. After Banaue, Alona has been my favourite place in the Philippines. It’s not only affordable, but quiet and beautiful. I hope it can be explored on the cheap by more travelers! Many thanks for having me here! Thanks very much for writing this great article for us, Agness! Keep living the dream!